Sometimes, the cover of the New Yorker completely sums up exactly how I'm feeling about the state of the world. 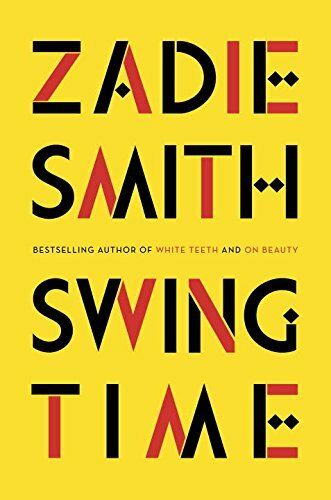 It's funny how perfect an issue's cover can be regarding current events, life changes, world affairs, all with wit, humor, class, and incredible artistry. I grew up loving the cover of the New Yorker more than I loved the content, as a kid I just assumed it was too highfalutin for me. The bathroom of my grandparents' home in California was decoupaged from floor to ceiling in three years worth of covers from the early 1970's, and I recall my time spent well in that tiny space taking in the covers. It's an unspoken truth that when I have a home of my own someday, I fully intend on covering an entire wall in my favorite covers. When it comes to expressing important facts and moments in my life, I can't help but recall the cover that published the week I graduated from Knox College in 2010. 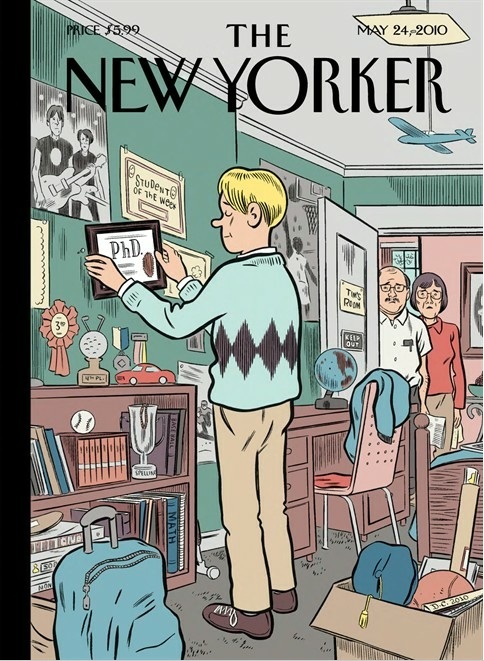 The image, titled Boomerang Generation by Daniel Clowes, depicts a PhD. moving back in with his parents - a reality I understood but didn't quite grasp until I lived with my parents for over a year after graduating. We were only two years into the recession, and already Clowes was showing the truth that a lot of us recent grads were facing. We earn degrees, we are sent out into the world, we are expected to be successful, and move out of are parents' homes, but jobs are few and far between. Repaying student loans is real and scary - not to mention incredibly relevant given the talk of raising the interest rate. Fast forward two years later, to a recent cover of the New Yorker. Here we have the illustration titled Adrift by Mark Ulriksen. 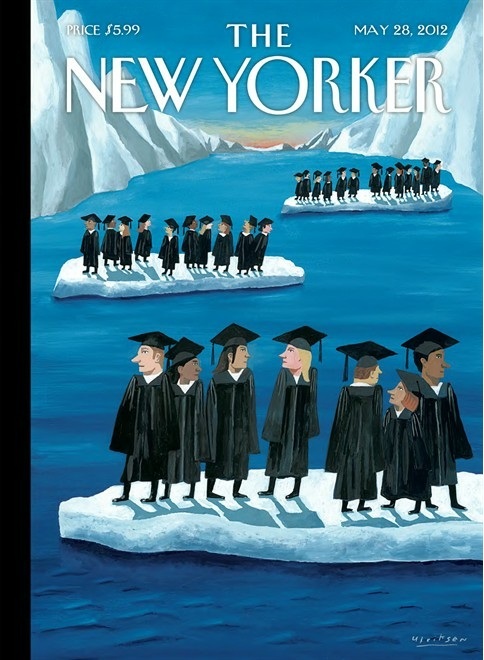 Graduates float without direction on ice islands, their future unknown but pressing given that the ice they float on will surely melt. This work wraps into it the recent graduate's ongoing fear of the future and possesses a sincere lack of direction. Images of rapidly melting glaciers come out of the impending doom of the threat of global climate change. This particular illustration works in such a way to describe the anxiety of what it is to enter the world in such a strange and unstable time. We students were told that we needed to go to college. That having a degree distinguishes us, and makes us more eligible candidates for careers. I began school in 2006, and in 2008 everything changed. In 2010, I graduated into a recession. I was an intern, I was briefly unemployed, and then I was a temp working 35 hours a week without benefits or the promise of ever being hired. I came into work everyday wondering if I was going to be let go. I continued to live in my parent's house because I wasn't sure if I would ever have a full-time job. I came into work day after day not knowing my purpose or my value. And though I am incredibly grateful to have been hired, I am still incredibly unsure of myself. Living for a year and a half with the mentality that any day I could be fired has had an incredibly damaging effect on me. I still possess a great level of anxiety over my own job security. Often times, I wake up anxious about my job. I still periodically find myself looking for other jobs because I am not even sure if I've dreamed this up, if I've really been hired. And then there's the never-ending question of if I am being utilized in a way that speaks to my potential. Am I using my brain? Is my job creative, or even fulfilling? I'm not angry at what happened with the economy - at least not angry enough to go out and protest. But I am careful with my money. I am aware that I have to work hard. I am accepting of the fact that I will be paying off a student loan for the next ten years, and that I probably will not go back to school unless I can justify taking out another loan for it. I also know that it will be a very long time before I own a house. That I will be living in apartments that don't suit my taste for sometime, because my pay check won't allow it. I'm not mad, I'm accepting that this is the world that I unfortunately graduated into. I am cautious, I am wary of new investments, and I am terrified of what is going to happen to future graduates. But the world keeps turning, and this is what I have to work with. So I will continue to read into every cover of the New Yorker, save my favorite ones, with the dream that one day, I will own a home with walls papered with my favorite covers from my favorite publication. This is really thoughtful and honest post, Sandy. Acceptance of instability is difficult to say the least and I admire you for working on it. I hear a lot of the same fears, hopes, and goals from my other friends your age and it's nice to know you're part of a community. Besides, we're a generation who probably won't have "careers" and if there's one benefit to that it's that we actually have the ability to ask ourselves what we really want and need and expect.I think as long as you keep asking yourself these questions and taking note of the ones that remain unanswered, you're in a good spot.